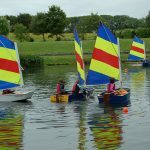 Volunteers from the Boatshed built a total of 59 small dinghies with primary school pupils during the 6 years from 2011 to 2016. 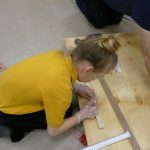 The project initially had the simple aim of building 6 Optimist dinghies for the schools’ participation and experience in sailing during the 2 weeks prior to the annual Scottish Traditional Boat Festival. 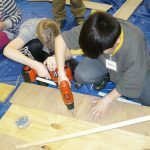 However, it very quickly became obvious that the process of building the boat was far more important and educational than the finished boat itself. The boats were initially sailed on Loch Soy, but the wind was so variable that the children spent more time paddling than sailing. So, the design was changed to allow 4 pupils to paddle the boat instead, and it was called the Pessimist. The boat building was originally undertaken upstairs in the Salmon Bothy, with each local school sending teams of 4 pupils, usually with a teaching assistant. Normally, work was undertaken on 4 boats at one time, however on one occasion there were 20 pupils and 9 adults working on 6 boats, quite an undertaking for all involved! The process from building to painting a boat takes a total of 4 weeks. 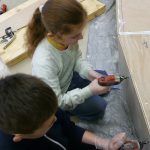 The bulkheads are made in advance, and materials pre-cut to approximate sizes before the day of the build, however there is still a great deal of cutting and assembly to be carried out by the pupils, who undertake all the measuring and marking out, drilling, countersinking, gluing and screwing, and planing. 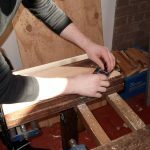 In 2015, due to changes made by Aberdeenshire Council, pupils were no longer able to travel to the Salmon Bothy for the boat building sessions, so as a result the design was once again altered to allow the Boatshed team to undertake boat building within the schools. The boat building kit changed, with materials pre-cut to size, but the pupils still carried out all the tasks apart from planning; we called the boat the Pragamist! In 2016, the final 11 boats were built in the schools. Unfortunately, we have had to take a reluctant break in activities during 2017 due to work commitments and poor health of some of our volunteer team, however we hope to be back soon – the aim of building 100 boats in 10 years may yet be achieved! If you would like to find out more about the work we do with local Primary School pupils, or indeed would like to join our team of enthusiastic volunteers, please contact us. Photos used with permission and thanks to: Bill Bain, Kathy Mansfield, Vivien Rae, Allan Robertson Photography, Photograpy By Anne Smith, Wendy Stones, Allan Sutherland Photography, Ian Tillett.